Brace yourselves. You are about to hear talk this week of an astronomical non-occurrence of the utmost in obscurity. We’re talking about this weekend’s Blue Moon. Now, I know what you’re thinking. Isn’t a ‘Blue Moon’ the second Full Moon of the month? How can a Blue Moon fall on the 21st? Trust me, we’re both correct… in a sense. The term ‘Blue Moon’ has taken on several meanings over the last few decades, with the ‘the second Full Moon in a calendar month containing two Full Moons’ now in vogue across ye old Internet. It seems the masses just can’t get enough of Super, Blood, Honey and Moons Black and Blue. We point to last month’s rumored ‘Green Moon‘ as evidence. (Spoiler alert: it wasn’t). No, we’re talking instead of a Blue Moon in an old-timey sense. You’ll be hard pressed to explain source of this week’s Blue Moon for sure, though it has a fascinating origin story. A Full Moon rising with Saturn and Mars on the night of May 21st, 2016. Image credit: Starry Night Education software. The term seems to come down to us from the Maine Farmer’s Almanac, which denoted the ‘third Full Moon in an astronomical season with four as blue.’ The lunar synodic period of 29.5 days — the length of time it takes the Moon to return to a like phase, such as New to New, or Full to Full — means that on most years, there are 12 Full Moons. 29.5 times 12 comes out about 11 days short of a 365.25 day solar year at 354 days, meaning that about every three years, we have a year with 13 Full Moons. Not a big deal, you say? Well, it assures that lunar based forms of reckoning time, such as the Muslim calendar loses 11 days relative to the Gregorian calendar every year. The last time we had a season with four Full Moons was August 21st, 2013, and the next Blue Moon under this rule is May 18th, 2019. Of course, a deeper riddle is just why the Maine Farmer’s Almanac termed this occurrence as Blue, and why they picked the 3rd of a season with 4 specifically… one legend goes that the extra anomalous Full Moon was depicted on the calendar in blue ink to stand out. We’d love to get our hands on a copy of the Old Maine Farmer’s Almanac circa late 19th early 20th century era to see if this was indeed the case. This is on our list of research projects, next time we find ourselves back in our home state of Maine. We’ve chronicled the tales of Moons, both Black and Blue. Sky and Telescope also explored the role they had in introducing the modern day Blue Moon into common vernacular. We’ll admit, the ‘2nd in a month with two Full Moons’ is a much easier rule to explain! Of course, the Moon isn’t scheduled to actually appear blue this week… that’s actually a much rarer occurrence, and the Moon doesn’t need to even be Full for this to happen. In September 23rd, 1950, the residents of the northeastern United States saw the 94% illuminated waxing gibbous Moon rise with a distinctly bluish cast, owing to the high concentration of oily soot particles suspended high in the atmosphere, scattering out red and yellow light but filtering through blue. Reports of similar Blue Moons dot observational lore, though to our knowledge, no one has actually captured an image of such a cerulean apparition of the Moon. Is the Moon ever really Full? You can make a pretty good argument that the Moon as seen from the Earth is never truly fully illuminated, though it gets really close. Full 100% illumination would occur when the Moon is exactly opposite to the Sun, but when this occurs, the Moon also passes into the dark shadow of the Earth, during a total lunar eclipse. Fun fact: the next ‘Blue Blood Moon’ lunar eclipse occurs on January 31st, 2018, following the ‘2nd Full Moon in a month with 2′ rule. The May Full Moon also has the romantic name of the Full Flower, Corn Planting or Milk Moon in Algonquin Indian lore. In 2016, the Moon continues to follow a shallow path relative to the ecliptic plane, which in turn traces out the Earth’s path around the Sun. 2015 was the bottoming out of the ‘shallow year’ known as a minor lunar standstill, and we’re now headed towards a hilly or steep year of a major lunar standstill in 2025, a time once every 19 years when the Moon rides high in the sky, adding its 5 degree inclination relative to the ecliptic plane. Will this weekend’s olden times Blue Moon gain traction in today’s fast-paced social media news cycle? Stay tuned! Of course the Moon has reason to be “blue” (if we want to anthropomorphize a little) with the recent death of the first Moonwalker, Neil Armstrong. And sometimes the Moon can actually appear to be blue if volcanic ash or forest fire ash are in the atmosphere in your location, since ash particles can scatter away all the warm colors in Moonlight, leaving a pale blue tint to the Moon. Our readers sent in their Blue Moon images from last night, and some, like the one above, used a little image editing magic to make the Moon appear blue, but most are just gorgeous images of our closest neighbor and constant companion in space. Clouds and lighting give the Moon a blue tint, too, in Paris, France. Credit: VegaStarCarpentier on Flick. The Blue Moon on 08-31-2012, from Dayton, Ohio. Equipment: Modified Canon Rebel Xsi & 6″ F8 Cave reflector Scope, 1200mm, ISO 400 1/640 second exposure. Credit: John Chumack. The Moon on August 31, 2012 from Uberaba, Curitiba – Paraná, Brazil. Credit: Glauco Hass on Flickr. The Moon on 31/08/2012 – 23:15 TL – from São Paulo, Brazil. Equipment: Maksutov Cassegrain Vixen 110 mm – F = 1035 mm – F/9.4 – Plano Focal – Nikon D3100 – 1/200 – ISO 100. Credit: Ednilson Oliveira. August’s Other Full – “Blue” – Moon (on the 31st) as seen from Lowell, Michigan. Credit: Kevin’s Stuff on Flickr. Great close-up (and not a crop) of the Moon on August 30, 2012 from Kopreinitz Koprivnicko-Krizevacka, Croatia. Credit: Eddie MacGraw on Flickr. A helicopter by the Moon on August 30, 2012 as seen from London, England. The exhaust heat from the chopper distorts the light from the Moon. Credit: Sculptor Lil on Flickr. Sugar Loaf, New York – The almost full moon rises behind Sugar Loaf Mountain on August 30, 2012. Credit: Tom Bushey on Flickr. When are the next Blue Moons? When you hear someone say “Once in a Blue Moon” you know what they mean. They’re usually talking about something rare, silly, and even absurd. After all, when was the last time you saw the Moon turn blue? Well, rare or not, we’re having one this week, and according to astronomer David Reneke writer and publicist for Australasian Science magazine, a Blue Moon is slated for the last day of this month, Friday, August 31. Full Moons are separated by 29 days, while most months are 30 or 31 days long, so it is possible to fit two Full Moons in a single month. This happens every two and a half years, on average. By the way, February is the only month that can never have a Blue Moon by this definition. We had one Full Moon on August 2 this year and the second will be Friday night. Does the Blue Moon actually turn blue? No. 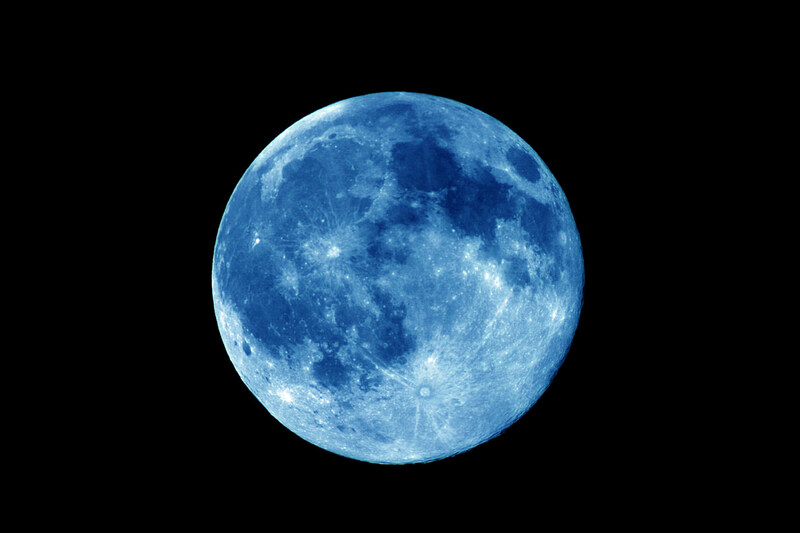 Physically colored Blue Moons are rare, and that’s where the phrase comes from, “Once in a Blue Moon”. There are occasions though when pollution in the Earth’s atmosphere can make the Moon appear to look blue in color. The extra dust scatters blue light. For example, the Moon appeared bluish green across the entire Earth for about 2 years after the eruption of Krakatoa in 1883. There were also reports of a blue-green coloured Moon caused by Mt. St. Helens in 1980 and Mount Pinatubo in 1991. “So in a sneaky sort of way, it could be true,” Dave said with a grin. Look up at the night sky on August 31 and see for yourself. Everywhere in the world the full Moon rises in the east just as the Sun is setting in the west. Story Contributed by Dave Reneke. Image Credit: John Chumack.